Table tennis equipment is very important. It decides not only your playing style but also increases your potential for victory. Yes! It’s nothing wrong if you focus on the best table tennis blade, rubber or other accessories. So today, I will explain to you how to choose your best equipment which fits your playing style, which can help you win more in table tennis. I also explain the common errors that new players often commit when buying their first equipment. These mistakes are “expensive”! Avoid them at all cost! What is table tennis booster? So why the ball of Chinese players has much power and speed? a racket: composed of a blade and 2 rubbers. You can’t use the same color for these two rubbers. One rubber must be black, and another one must be red. a ball: 40+ mm table tennis ball, color white or orange. Nowadays, you must use a Poly Ball 40+. We don’t play the celluloid ball 38 mm anymore. a table: official table tennis tables are 2.74 m in length, 1.525 m wide and 0.76 m high. And the net included which is 15.25 cm high. blade: its role is giving the feeling of the ball. It’s like an extension of your arm. The blade decides 80% your playing style. rubber: add the speed and the spin to the ball. Choosing the right combination (blade + rubber) is crucial. The rubber complete 20% of the characteristic of the racket. clothing and shoes: Clothing (T-Shirt, Shorts) and shoes are your images. It not only shows your etiquette, your professionalism but also your attitude to the sport. Please remember: There is no best setup in table tennis. The best equipment is the one that suits your playing styles. What is the equipment used in table tennis? You don’t need many types of equipment in table tennis: just a racket, a ball, a table. That’s why table tennis is the most popular recreational sports. 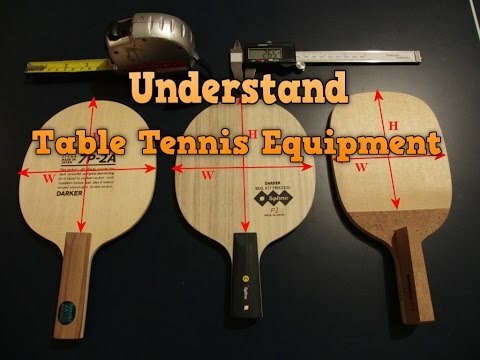 Here are the most important types of equipment needed in table tennis. You need to have also short, and a pair of shoe to play table tennis. Many new players made the “expensive mistakes” when choosing their first equipment in table tennis. It costs you not only money $$$, but also it destroys the golden time in your development stage. 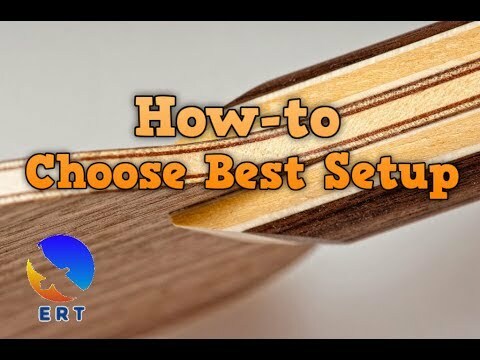 Below I explain the best way to choose your right equipment. Table tennis rackets are the combination of the blade and two rubbers. A racket is made by the blade and two rubbers. You should make your own racket, don’t buy the premade racket. You need to choose the right combination. Don’t choose a too hard blade and combine it with hard and fast rubber. Or don’t choose a flexible blade, and combine it with thin and soft rubber. I’ve explained, “how to choose your best table tennis rackets“. You need to cut your rubbers perfectly and glue it to the bare blade. The blade is a wood, so it will absorb the humidity rapidly. After gluing the rubber correctly, you need to protect your racket for the long term. In table tennis equipment, there is the blade and the rubber. The blade decides 80% of the quality of the shots. You should choose a good blade, based on your playing style. The rubber is about 20% and should be combined with a blade. You should learn how to make a good combination of table tennis. For example, don’t combine flexible, slow blade with thin, soft, and weak rubber. Don’t put your racket in the humid condition. Remember, wood hates water! Please protect your racket! Study and search for the professional ping pong equipment. There is a reason behind why they prefer these combinations (blade + rubber). If you are a new player, buy your first equipment (under 40$). Don’t buy too expensive equipment for the first time! In table tennis, there are many types of rubber: Pips-in rubber, pips-out rubber, anti-top rubber, Chinese rubber, ESN rubber, Japanese rubber, long pimples rubber, short pips, frictionless pips, sandpaper rubber, etc. Long pimples: Long pimples (or long pips) is the pips-out table tennis rubbers. This type of rubber has a specific effect: Reverse spin of the ball. Due to the different mechanism of backhand and forehand stroke. You should use the different type of rubber for forehand, and backhand. So backhand rubber, and forehand rubber is not the same. Forehand rubbers are generally harder than the backhand side. You should choose +2 hardness degree than your backhand rubber. DHS Hurricane 3 is the common Chinese rubbers used by many professional players. Hurricane 3 on Forehand. The blade is Viscaria. If you use Chinese forehand rubber, you should consider boosting it. Many players asked me “How to choose a good backhand rubber?”. Here is the list of top 10 backhand table tennis rubber that the professional players use! Well, you need to choose a fast, and bouncier rubber than your forehand rubber. Because your backhand stroke is shorter, and in general, weaker than your forehand stroke. In general, most ESN (European rubber), and Japanese (like Butterfly Tenergy and variant) are good backhand rubber. You can stick with them. For a beginner, stick with 2.0 mm. And use 2.2 mm, and Max for advanced players. Don’t play with too thin, or too thick (2.3 mm, and MAX) if you are new. Too thin backhand rubber is bad for beginners. You can use “SEARCH” on this site, and try to search for your favorite rubber. Table Tennis rubber is glued to a blade to make a complete racket. You need a red and a black rubber for your paddle (based on the official rubber rules). Red rubber is usually harder than black rubber. Black rubber is tackier. Read and black rubbers are not the same! Read the explication here. Rubbers need to have 2 colors. Chinese table tennis player prefers using hard and tacky Chinese rubber on their forehand side. Chinese table tennis rubbers have the hard sponge and tacky topsheet. Hard sponge gives the linear feeling and precision in the shots. Tacky topsheet helps player add spin and control to the service. That’s the reason why Chinese players prefer playing with tacky topsheet. Chinese rubbers require good foundation techniques (footwork, timing and body motions). Compared to the Japanse rubber, and Europe rubber, Chinese rubber is harder to use for beginners. The most famous Chinese rubbers brands are Double Happiness (DHS), Friendship 729, and Globe. Table tennis shoes are different than the badminton, or tennis shoes. Choose the wrong shoe can affect your table tennis footwork. Between several brands, Joola and Butterfly shoes are my favorite one. I recommend you buy the Stiga Optimum 30! It’s for the serious competitive table tennis player! High quality and standardized bounce! If you don’t know what to choose, take the Butterfly Free Chack. It glues very well, and very clean to remove the residual glue on your rubbers. Booster (also called as tuner, expander) is the chemical substance. Table tennis players use the booster to tune their rubbers to add more spin and speed. There are many table tennis boosters available on the market: Haifu, Danchi, Falco, Revolution, etc. Should I use the booster: No! Is booster harmful to player’s health: Yes. Does pro players use booster: Yes! Mostly in China. Read more about Chinese table tennis rubbers (national Hurricane 3, Blue sponge, fake and real rubbers, etc). Why the pro tune their Chinese rubbers? Because the booster enhances bout +10% speed and 15% spin. Returning board: You need a table and a returning board. Practice alone your forehand and backhand techniques. Ball holder: To practice the acceleration and the topspin feeling. The string: To improve the strength of your core muscle (back, legs, hips). Table tennis racket is the main equipment in table tennis. A racket (also called as a “bat” in Europe, or a “paddle” in United State) composes of a blade and two rubbers on the two sides. Remember: If you a beginner in table tennis, never choose a very fast table tennis racket (too thick, too hard, or with carbon layer). The too fast racket will ruin your development stage in table tennis. The Chinese philosophy of table tennis blade: The blade should be an extension of your hand. It shouldn’t be too hard, too stiff nor too soft. The blade is where you make the ball spin. That’s why Chinese player loves Stiga blade! Because the Stiga blade has: Good quality of wood. Clear vibration provides good feeling. The blade and the rubber of Ma Long. Western table tennis philosophy is different: They prefer a harder blade, carbon blade. They want to increase the speed of the ball, however, the feeling, consistency, and confidence decrease. Chinese philosophy: Blade should give you control, you should consider a blade as your hand, many feeling, soft, delicate, … you can drop shot, play with the ball, or can strike very hard. It’s like a short hammer is more consistent than a long one. The blade is an extension of your hand. Do you dare to hit harder and harder if the ball always goes outside the table? No! It’s the confidence! If you use a good feeling, not too fast blade, you have confidence! Western player compensate the speed by using the carbon blade! But it’s a wrong way! Use a slower blade, but increase the confidence is the best way! “Chinese player using good feeling blade has confidence”. The second reason is the secret of the Chinese National Team: hard, very hard rubber, tacky rubber. Why? Chinese players like good control, flexible blade, and hard rubber. European players like hard, fast blade and soft rubber. Because the philosophies are different. For Chinese, a blade is for feeling and spin, rubber is for speed and power. For Western, a blade is for speed, and rubber is for the spin. They use soft rubber to generate spin, and fast blade to increase the speed. However, it’s wrong! In fact, the power and the spin come from your technique. The blade is an extension of your hand. The power comes from the ground (by rotation of the hip, legs), the spin comes from the elbow, wrist, rotation of the waist. That’s the Chinese philosophy. Remember my video about Zhang Jike; I’ve said that “Power comes from the ground”. That’s why Zhang Jike’s legs are so powerful! You are confused by many Chinese rubbers: Hurricane, Skyline, Tinarc, H3, H2, TG3, TG2, H8, National, Provincial, Commercial, Blue Sponge, Orange Sponge. Change the equipment based on your technique. Don’t buy any equipment and learn the technique after! 90% of your table tennis comes from your technique, not the equipment! If you are in the wrong way: Use a very fast blade, and soft rubber to generate spin! Feel the ball with the blade. Find a good blade. The power comes from the technique. Firstly focus on the consistency. Then to increase the speed, the power of your shots, you train the physical strength. The power will come naturally. This is the secret of Chinese table tennis. For the soft rubber, you can’t hit harder. it has a limit. If you hit harder, the ball will go outside the table. It’s easy to topspin, but topspin with power is not as comfortable. For medium/harder rubber, this limit is much higher, your ball is spinnier and faster! rubber for my forehand side. Which rubber thickness should I prefer? 2.0 mm or 2.2 mm? For your forehand side, choose MAX rubber, 2.2 mm. You will hit hard with your forehand, if you choose 2.0 mm, the ball will “bottom out”, (very low throw angle). Use 2.0 mm, you will make less spin. So choose 2.2 mm, and hard rubber on your forehand side. Is it okay to choose a japanese rubber for my forehand saide? My blade is dhs power G7. I wanted to buy Chinese rubber like dhs hurricane 3 neo but I notice that there are alot of fake rubbers in the store. One of my friend bought a dhs hurricane 3 neo rubber and we noticed that it is fake becase the top sheet came off easily from the sponge. So coach, is it okay to buy a japanese rubber? they say that Japanese rubbers are durable.